The spine is composed of a series of bones called vertebrae, which have open spaces that contain the spinal cord. When these spaces become narrowed, the spinal cord is compressed, causing a condition called spinal stenosis. It usually occurs in the region of the neck or the lower back. When this happens, various symptoms can occur, including tingling, numbness, pain, muscle weakness, and impairment of bowel or bladder function. In severe cases, a surgery is necessary to make space for the spinal cord and relieve symptoms. What Are the Purposes of Spinal Stenosis Surgery? The main goal of surgery is to decompress or increase the space for the spinal cord and nerve roots, which will result in a decrease of pain due to nerve inflammation. It will also improve the sensory function and motor strength of your arms or legs. What Spinal Stenosis Surgery Options Are Available? Foraminotomy: this type of spinal stenosis surgery involves making larger the opening where a nerve root passes as it exits the vertebra. This opening (foramen) may be blocked by a bone spur or a bulging part of a spinal disc. Laminotomy: this type of surgery involves making larger the space containing the spinal cord by opening the bony plate (lamina) which normally protects the spinal cord. Laminectomy: if a laminotomy is not enough to create more space, part or all of the lamina may be removed at various levels of the spine. This can normally be done without causing harmful effects. Indirect decompression: this variation of decompression surgery may also be done by spreading bones apart without removing them. This can be done using instrumentation (hardware) or application of artificial discs to help restore the space between adjacent vertebrae. Some patients who have undergone spinal stenosis surgery need to undergo spinal fusion to stabilize the spine. These include cases where some vertebrae have slipped out of position, which could make the spine unstable, causing pinching of nerves. Stabilization may also be needed if the laminas of multiple vertebrae have been removed. In these cases, spinal fusion will help stabilize the spine. The surgical procedure involves fusion of bones over time, usually taking over several months. In this procedure, the surgeon takes a bone graft from your own body or uses some biological substance to stimulate bone growth. Spinal instrumentation using wires, plates, screws and rods is done to increase long-term stability of the spinal bones. 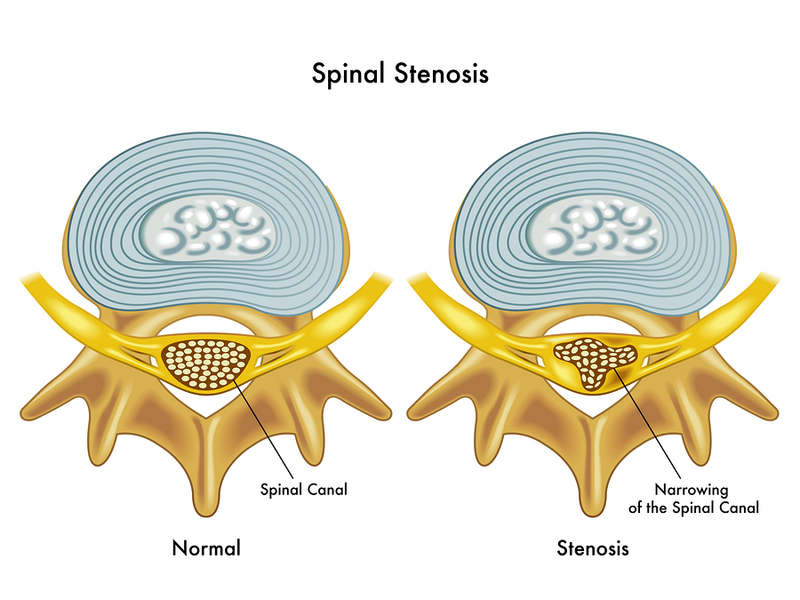 New developments in spinal stenosis surgery include the use of interspinous process devices, which have been successful for treating central canal stenosis. However, not all patients with spinal stenosis benefit from these, especially in patients who have more than two levels of vertebral central stenosis or in those where the devices may not be accommodated due to certain anatomies. Another method involves facet replacement or total replacement. However, the devices and techniques remain experimental. To know more about spinal stenosis and its surgical treatment options, watch this video. Aside from performing open surgery which involves a large incision in the back, surgeons can opt to do minimally invasive surgery, which uses only small incisions. An endoscope or a thin instrument with a tiny camera and other small surgical instruments are used to avoid tissue damage. However, not all patients may benefit from this option, and open surgery may be necessary for the surgeon to work on several vertebrae. In most cases, outcomes of the surgery are very rewarding. Most patients feel better after decompression surgery and they are able to go back to their normal activity following recovery. Many patients also achieve better tolerance for walking following surgery for spinal stenosis. Full recovery after spinal stenosis surgery usually takes 3 months, but patients who undergo spinal fusion may take longer to recover, depending on the extent of surgery and the patient’s progress in rehabilitation. Persistent pain may occur for a few days after surgery, which may require the use of nonsteroidal anti-inflammatory drugs to reduce pain and swelling. You may also be asked to start light exercises right after surgery to reduce swelling and prevent you from developing a stiff back. Click HERE to learn 11 exercises that can be done to manage spinal stenosis.